How It’s New York: It’s the home of publishing, and a vast literary center. There are readings every night of the week– especially this week! How It’s Irish: The journal The Stinging Fly is an Irish one, with great Irish writers in it. This issue blends Irish and American writers, thinking about New York! And you can pick it up at these vents. It’s €7, but you can pay in dollars. Because you’re in New York! The journal is here tonight, Wednesday and Thursday. New York Irish Arts’ Rachael Gilkey will cover the launch Thursday and review the issue, too! The Stinging Fly was established in 1997 to seek out, publish and promote the very best new Irish and international writing. We have a particular interest in encouraging new writers, and in promoting the short story form. 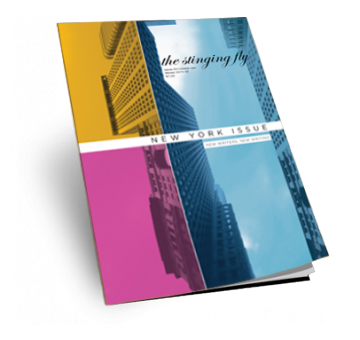 To celebrate the launch of The Stinging Fly’s special New York-themed issue, they have lined up three fantastic events on three consecutive nights on October 25th, 26th and 27th. Writing Dublin, Writing New York: a discussion moderated by Declan Meade. Imagine Ireland, Culture Ireland’s year of Irish arts in America, 2011. This panel will look at the literary bond between Dublin and New York and the writers that feel at home in both places. The panel features Nick Laird, Emer Martin, Sean O’Reilly, and Keith Ridgway with moderator Declan Meade. A reading hosted by Columbia: A Journal of Literature and Art. Columbia: A Journal welcomes The Stinging Fly editor Declan Meade, and writers Sean O’Reilly, Keith Ridgway, Aifric Mac Aodha, and Max McGuiness. The reading will be an intimate affair, with the unique opportunity for an audience to talk one-on-one with The Stinging Fly editor and the writers. The Stinging Fly in New York events are supported by Culture Ireland as part of Imagine Ireland, a year-long season of Irish arts in America in 2011.